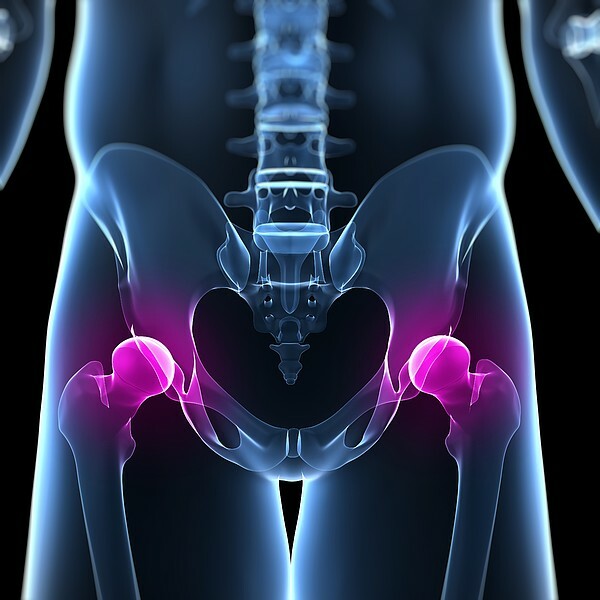 The anatomy of the hip includes the ball-and-socket joint that involve two separate bones namely, the thigh bone and the pelvis.The unique anatomy of the hip enables it to be extremely strong and agile controlling every position of the lower limb in both weight-bearing and non-weight-bearing movements. 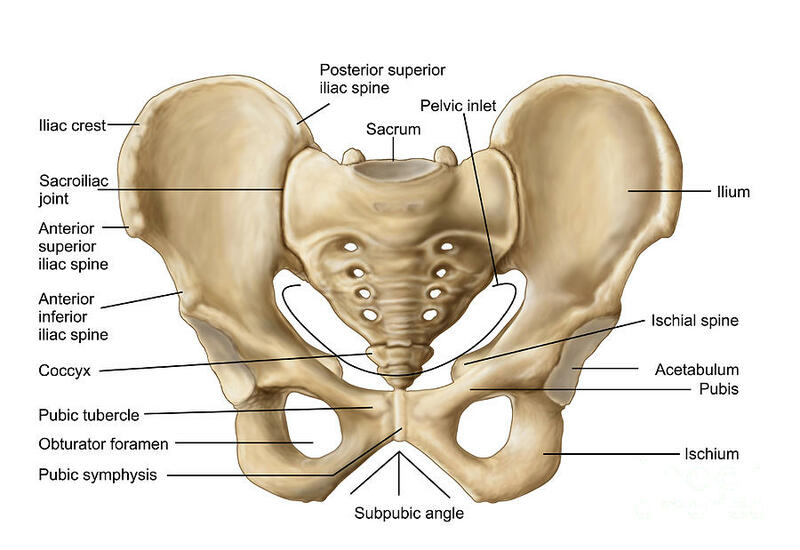 Fig 1: Shows the two Hip bones, sacrum, the acetabular socket of the hip joint, the entire Hip. As shown in Fig.1, the pelvis is made up of two halves or two hip bones. Each hip bone is formed from the fusion of three bones: ilium, ischium and pubis. Fusion of these three bones, form one solid pelvic bone. The Pelvic bone contributes to the hip socket or acetabulum. Each pubic bone connect in front at the symphysis pubis. Between the two hip bones, lies the foundation for the pelvis, the sacrum. The sacrum is a triangular-shaped bone that comprise of five fused bones at the lower end of the spine. 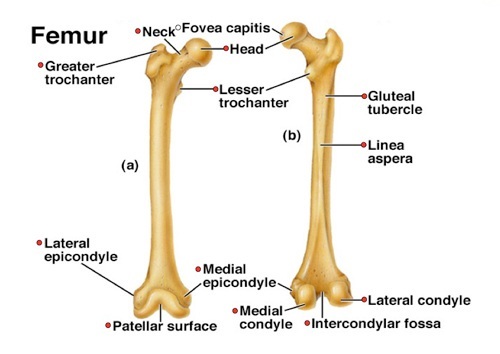 As shown in fig 2, the femur is more commonly known as the thigh bone which consists of the round head, the neck, the shaft and two condyles (lateral and medial) at the base of the femur. 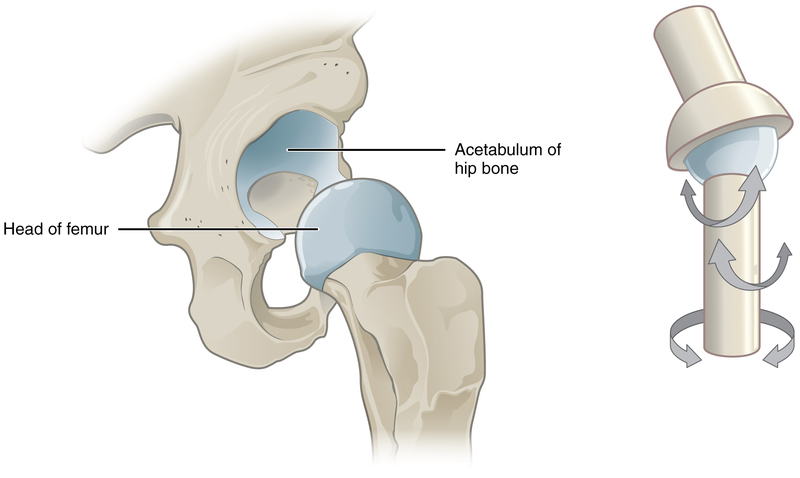 Like the shoulder, the hip joint is also a ball-and-socket joint, where the ball is the head of the femur, and the socket is the acetabulum. The articular cartilage is a protective material that covers the articular surfaces of the hip joint (refer Fig.4). It is about one-quarter of an inch in thickness with a rubbery consistency.The function of the cartilage is related to its structure and thus acts as a shock absorber by allowing better transmission of forces. It also helps prevent friction between the bones and is slippery enough to allow the joint surfaces to slide against one another without causing any damage. The Labrum is a fibrous rim of cartilage around the acetabular socket that holds the femoral head in the joint providing stability. 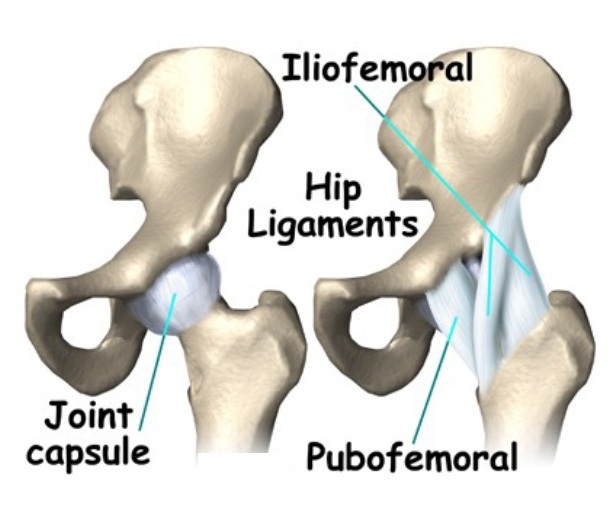 The joint capsule is a watertight sac that surrounds the hip joint. The capsule is reinforced by three major ligaments, which are denser bands of connective tissue. The attachments of each of these ligaments can be identified by its name- the iliofemoral ligament extends from the ilium on the pelvis to the femur, the pubofemoral ligament connects the pubic bone to the femur, and the ischiofemoral ligament extends from the ischium to the femur. 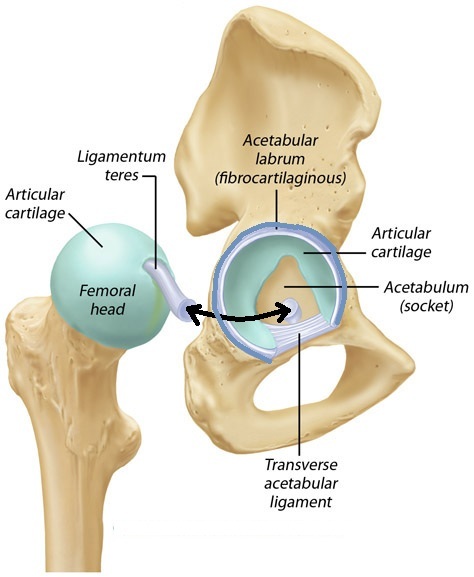 A small ligament called ligamentum teres connects the very tip of the femoral head to the acetabular socket. It accommodates a small artery within itself that brings an important blood supply to part of the femoral head. 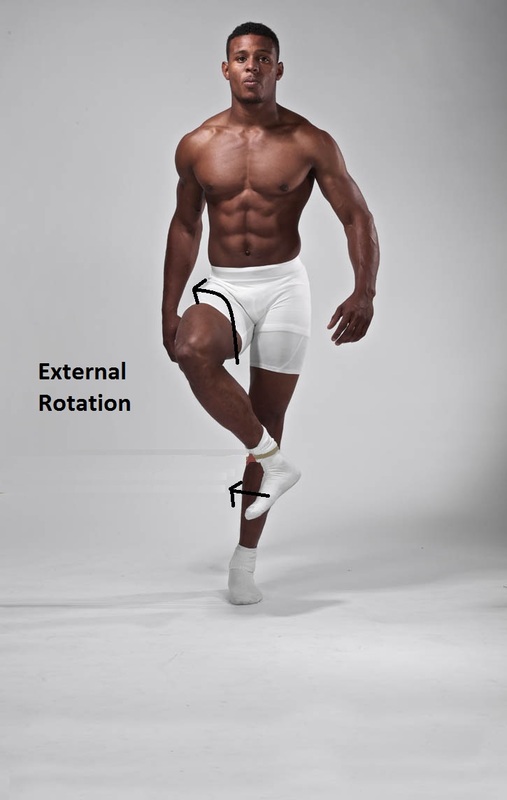 These muscles cause the hip to move backwards in extension (Fig 7), it also causes knee flexion (bending the knee by bringing the heel towards the buttock). 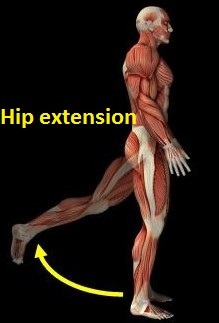 Hip extension is important during gait especially to propel your body forwards. 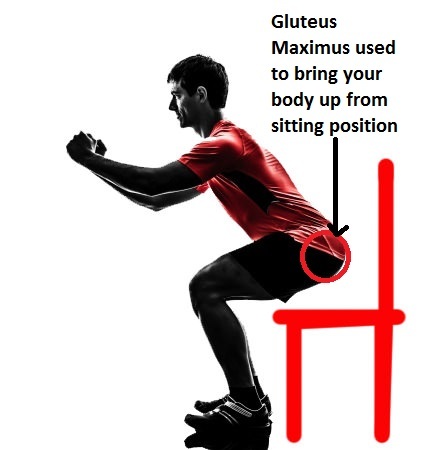 Gluteus maximus contraction is a powerful action that opposes the force of gravity. The action of gluteus maximus is to move the hip bone(thigh) backward from a position of full flexion(bent), as in climbing stairs, or rising from a squatting or sitting position. The hip flexors help you to draw your leg towards your chest and also helps to you move your legs from side to side and backwards. It serves to stabilize your hips, keeping the joints of your pelvis and lower back strong. 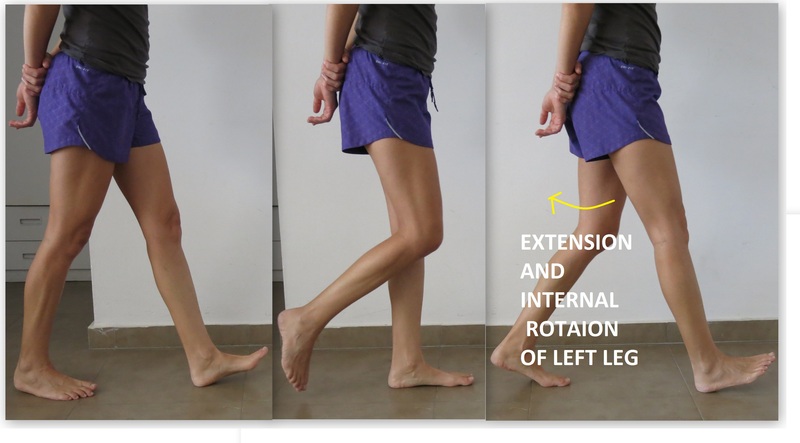 Hip flexion movement is also important during the gait cycle in order to bring you leg forwards for heel strike. When the foot is not planted on the ground, the adductors will bring the leg toward the midline of the body. Also known as an open kinetic chain movement (open kinetic chain is defined as a combination of successively arranged joints in which the terminal body segment can move freely). Apart from the adduction movement in open kinetic chain, adductors also contributes during closed kinetic chain movements (In a closed kinetic chain movement, the distal end of the extremity is fixed, emphasizing joint compression and, in turn, stabilizing the joints). A simple example would be during bilateral stance (standing on both legs) movement like squatting, adductors of both the hip joints help contribute to the stability in the pelvis. 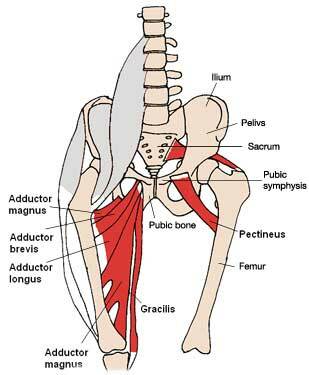 These adductors work with abductor muscles synergistically to provide side-to-side stabilization of the pelvis. During walking, adductors also contribute throughout the gait cycle. For example, when you foot is move forwards before striking on the ground, the adductors will bring the leg towards the midline. Similarily, adductors with help in flexing the hip when the thigh is in an extended position as in the swing phase of the gait (walking) cycle. They are not the prime movers but function in reflex response to gait activities. 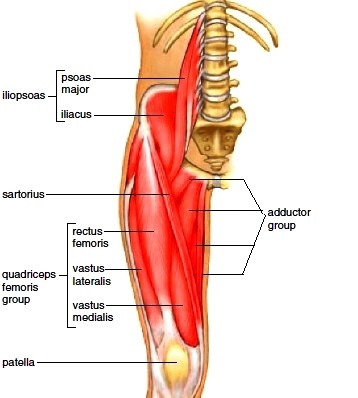 The only two-joint muscle of the adductor group, the gracilis, functions as an inner knee stabilizer and helps stabilize both the hip and knee during weight-bearing. In open kinetic chain movement when standing on one leg, the abductors move the leg away from the midline of the body. 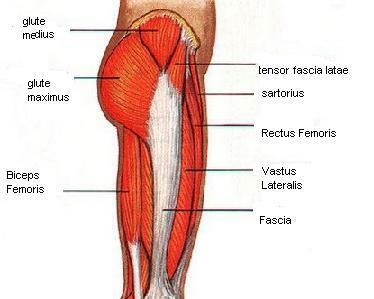 The gluteus medius however, is more of a lower extremity dynamic stabilizer than it is a pure hip abductor. If the gluteus medius and minimus are weak or atrophied, the pelvis will drop to the opposite side when you bear full weight on the same side during walking. This dysfunctional postural pattern is referred to as the Trendelenburg sign. 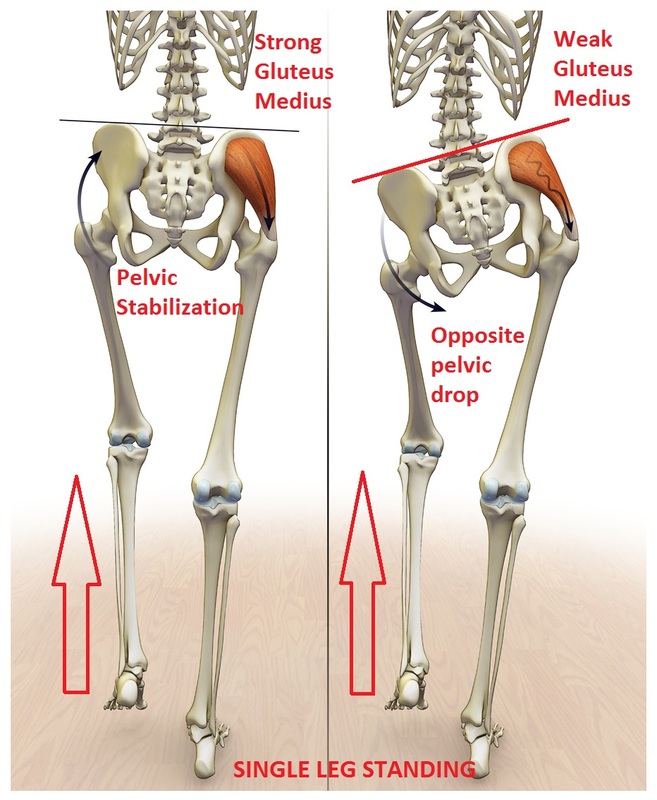 As you can see in fig 16, weakness of the right gluteus medius will cause the left hip to drop when standing on the right leg. Thus, during walking the primary function of the gluteus medius is to stabilize the pelvis when weight is shifted from one side to the other. In the open kinetic chain the primary and secondary external rotators turn the lower limb outwards in relation to a fixed pelvis. This action is seen with the movement of the hip with knee flexion as seen in Fig 17. However, in the closed kinetic chain scenario, with the foot fixed on the ground, the activation of these same muscles will cause the same movement at the hip-pelvis interface will cause the pelvis/torso to rotate. For example, refer Fig 18. a closed chain right lower limb, upon activation of the external hip rotators the person’s pelvis and trunk will rotate to the left simultaneously (counterclockwise rotation) along the vertical body axis about the fixed right limb. This rotation can occur from activation of not only the hip rotators but also from the muscles of the abdomen, thoracic spine and rib cage. During weight bearing, the deep rotators having a short moment arm and smaller in area there is minimal capacity of rotational force and more of a horizontal line of force, which is more important in the compression of the joint surfaces.Thus creating more stability in the hip joint during movements. The head of thigh bone (femur) rotates inwards within the hip joint. It also occurs in standing when the lower limb is fixed and the trunk/pelvis rotates as already seen in hip external rotation. Internal rotation is the exact opposite. In the open kinetic chain, the internal rotators turn the lower limb inwards in relation to a fixed pelvis. This action is seen with the movement of the hip with knee flexion as seen in Fig 19. Similarily, Fig 20 shows a closed chain right lower limb, upon activation of the internal hip rotators driven by the person’s pelvis and rotation to the Right side simultaneously (clockwise rotation) along the vertical body axis about the fixed right limb. 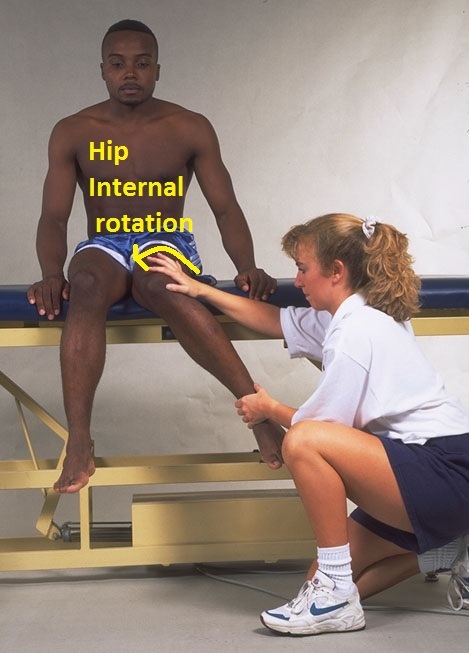 During walking, in order to sufficiently extend the hip toward the end of the gait cycle, there has to be enough hip internal rotation (Fig 21). Without sufficient internal rotation, the pelvis will move as far forward over the stance leg, and we instinctively shorten our stride. Fig 21: Hip extension and internal rotation of left hip joint in the final phase of the gait cycle. In conclusion, a thorough understanding of pelvic and hip anatomy is important for undermining any cause of dysfunction or injury. Even a lack of range of motion due to tightness in the soft tissue structures can put you at risk of involving compensatory movements that can lead to postural problems. Always seek medical advice when in doubt.